Retro Promenade has quickly become one of my favorite retrowave music sources. Not only to do they bring great music to each album, but they always include a piece of inspired fan art with every release. Earlier this year you might remember that I featured their Carpenter album and poster inspired by the films of John Carpenter. What does Beverly Hills Cop, Fletch, The Running Man, and Top Gun have in common? Harold Faltermeyer. The latest Retro Promenade album titled Faltermeyer draws on the '80s movie soundtracks composed and produced by Harold Faltermeyer. The 7-track compilation album features some of the premiere synth and retrowave artists like Who Ha and Starforce as well as a totally bitchin' accompanying poster that's '80s to-the-max! 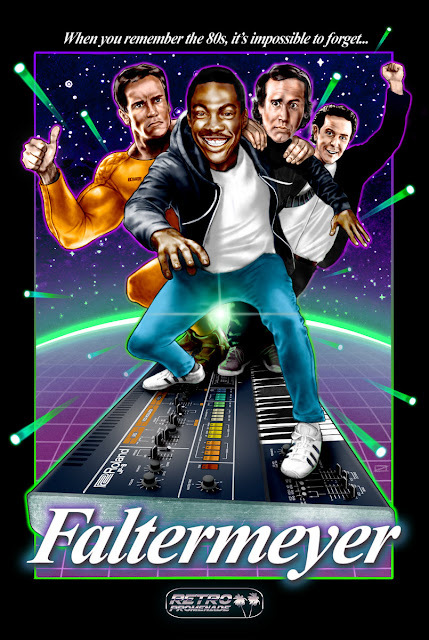 The poster features caricatures of Eddie Murphy, Arnold Schwarzenegger, Chevy Chase, and Judge Reinhold surfing on a synthesizer across the galaxy! Mind officially blown! The best part about the poster is it's available to purchase. Order now at the Faltermeyer Bandcamp page for $9.50 plus shipping with your choice of two color variants. You can also snag the new album for as little as FREE or for as much as you're willing to pay. PLUS! Get 15% off your order with the discount code faltrp15 when you purchase now through 12/25/15. If you're looking to outdo your friends this Christmas for giving the raddest present ever, I'd say look no further. Follow Retro Promenade on Facebook, Twitter, and SoundCloud.